Those trees! Kind of makes you want to stop and stare for awhile doesn’t it? 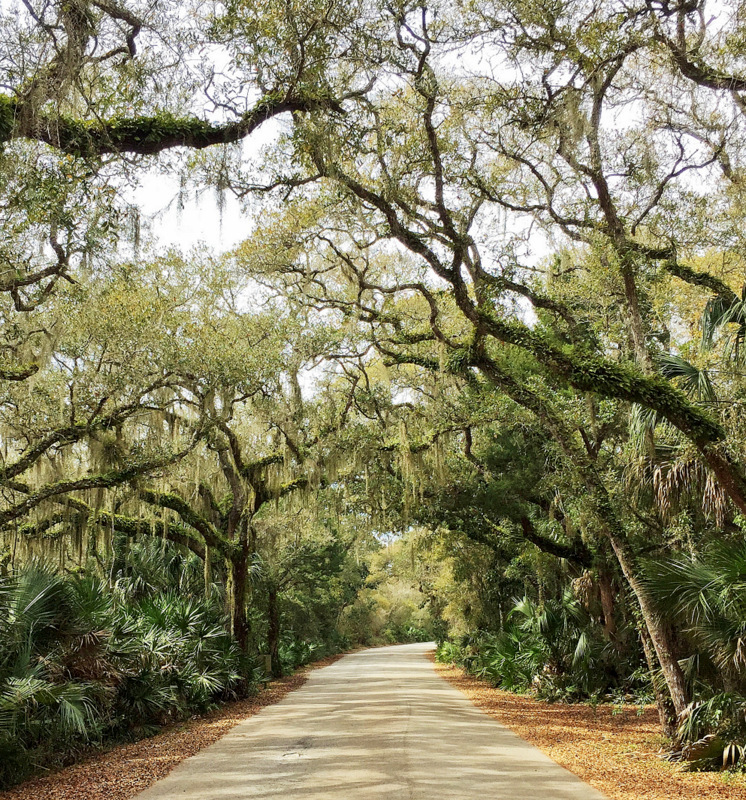 We spent all of last week surrounded by these moss draped beauties at the lovely Anastasia State Park located in the historic seaport of St. Augustine. 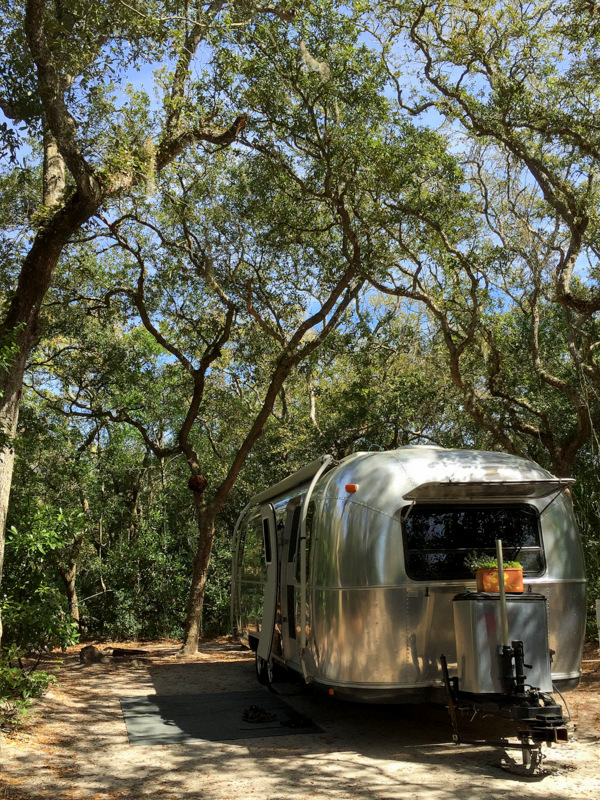 Our site was tucked back into the forest with twisting live oak branches towering overhead, and a dense undergrowth of palmettos provided ample privacy. 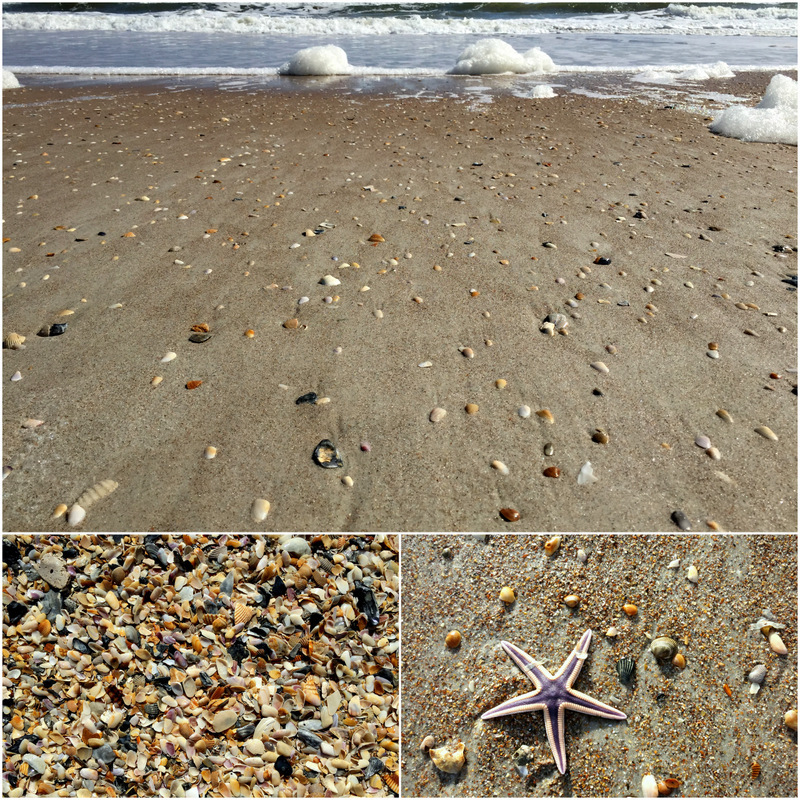 Only a short bike ride from our site was a long stretch of sandy shoreline where we spent several days in a row strolling up and down looking for shells and dipping our toes in the chilly water. 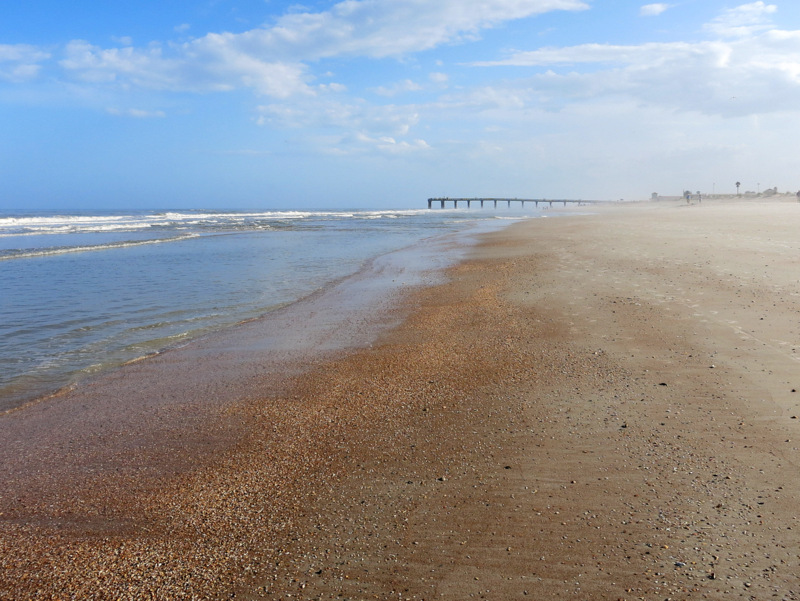 While we loved the campground and beach, we did manage to pry ourselves away a few times to venture into town. 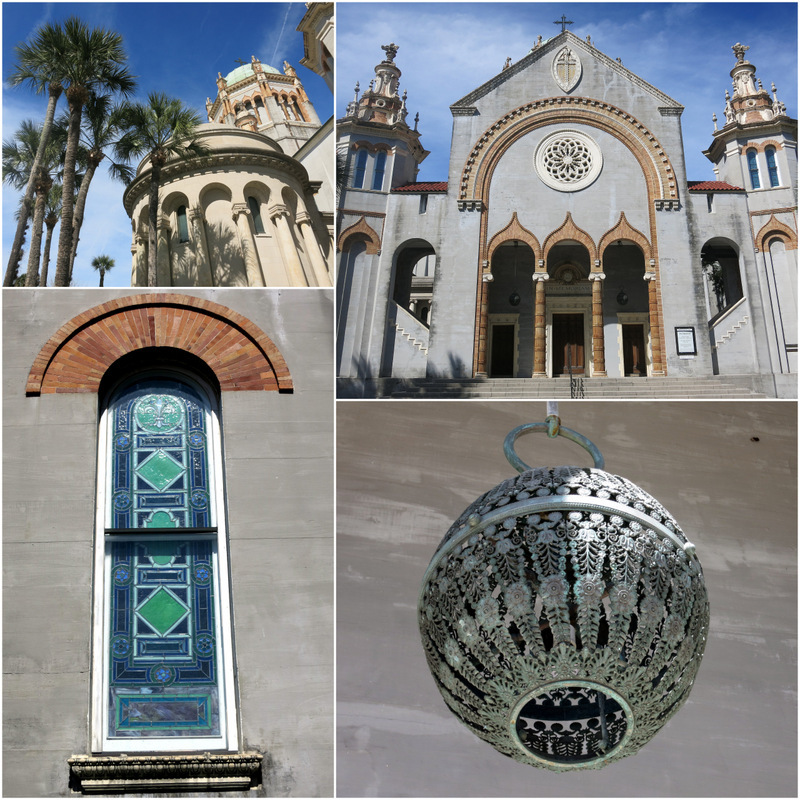 After all, we were in the oldest city in the U.S. I’ll spare you all the historic details (which you can find here or here), but the basic gist is that the Spanish explorer Pedro Menéndez de Avilés founded St. Augustine in 1565. 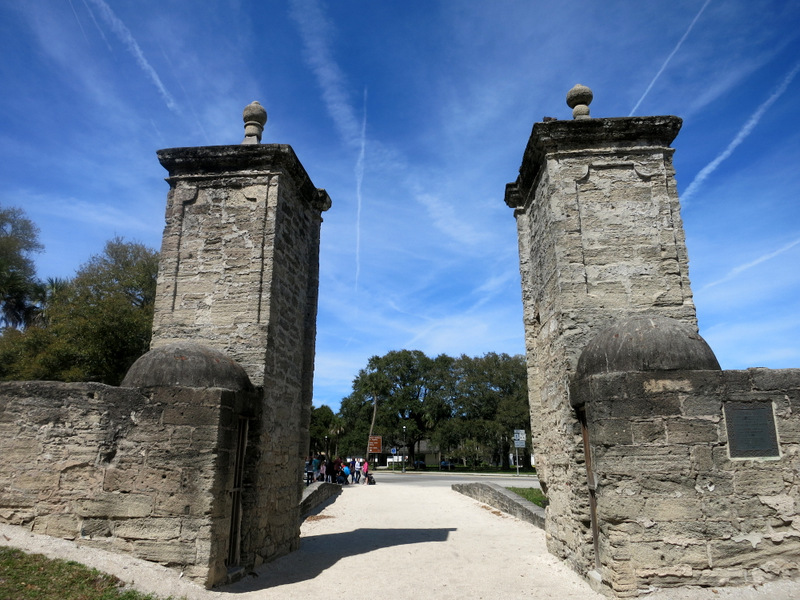 The city was under Spanish rule until around the mid 16th century when the 7 Years War ended and Spain ceded St. Augustine (along with the rest of Florida) to the British. The Brits kept control until 1783 when, through a series of land negotiations spurred by the Treaty of Paris, St. Augustine once again fell under Spanish Rule. 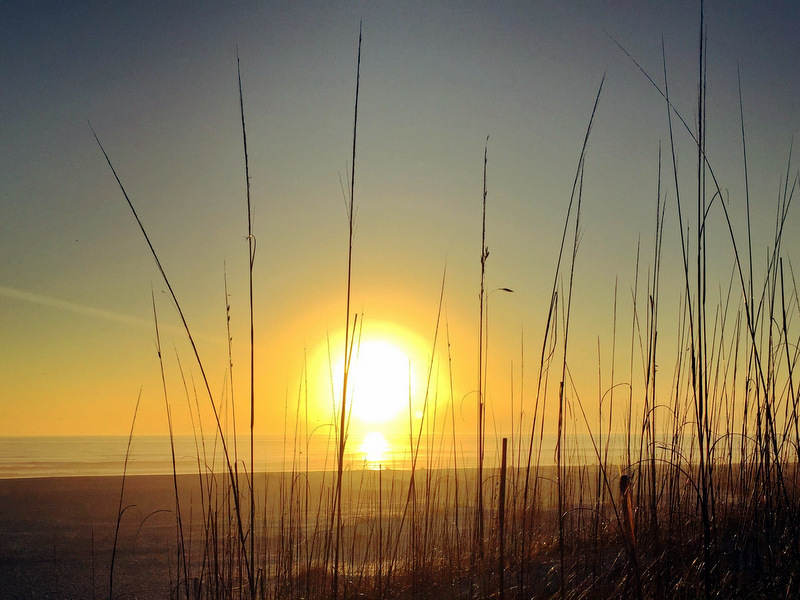 The city changed hands once more in 1822 when Florida officially became a territory of the United States. 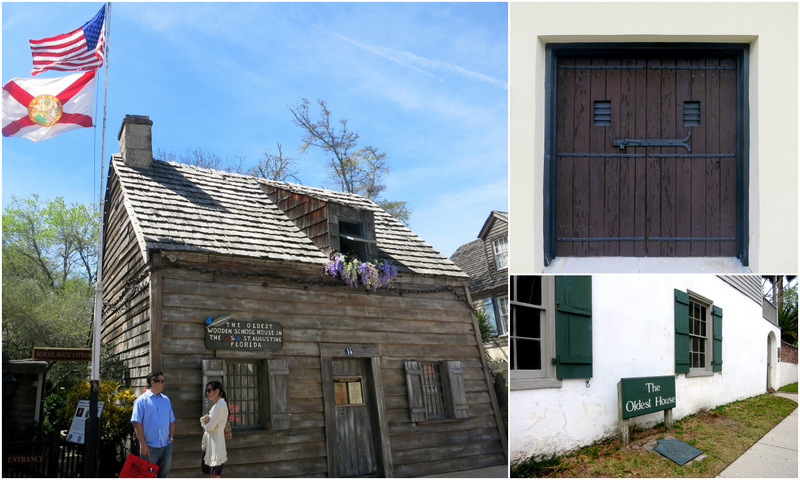 Of course, all this discounts the fact that long before the Spanish, the British, or the Americans got their hands on St. Augustine, the Timucuan Indians had an established settlement in the area. Which is why most historians refer to the oldest city as the Oldest Continuously Occupied European Settlement in the United States. Quite a mouthful right? No wonder most people just call it the oldest city. 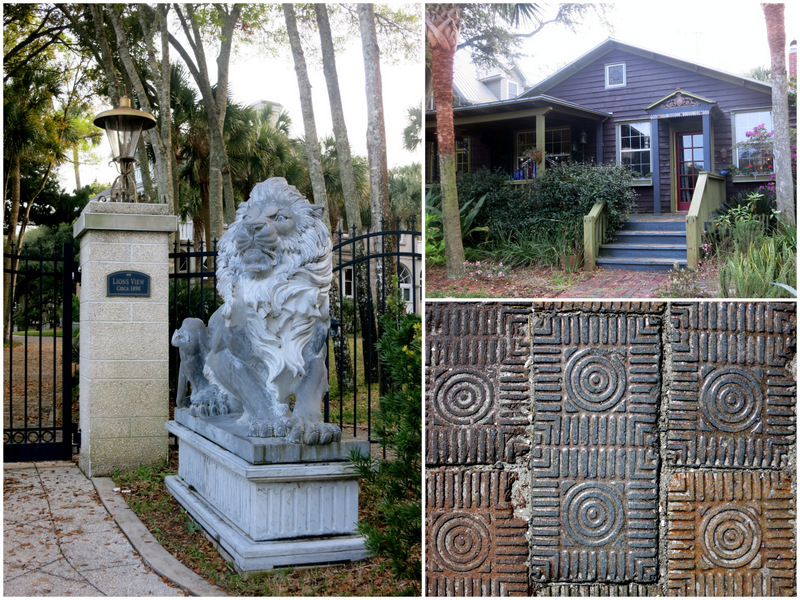 St. Augustine toady is a vibrant medium sized city full of interesting architecture, picturesque neighborhoods, and charming narrow streets. It’s also a VERY popular tourist destination. You can always recognizing a busy tourist town by the various modes of rental vehicles and trollies clogging up the streets. In Key West it was scooters and Conch Trains. 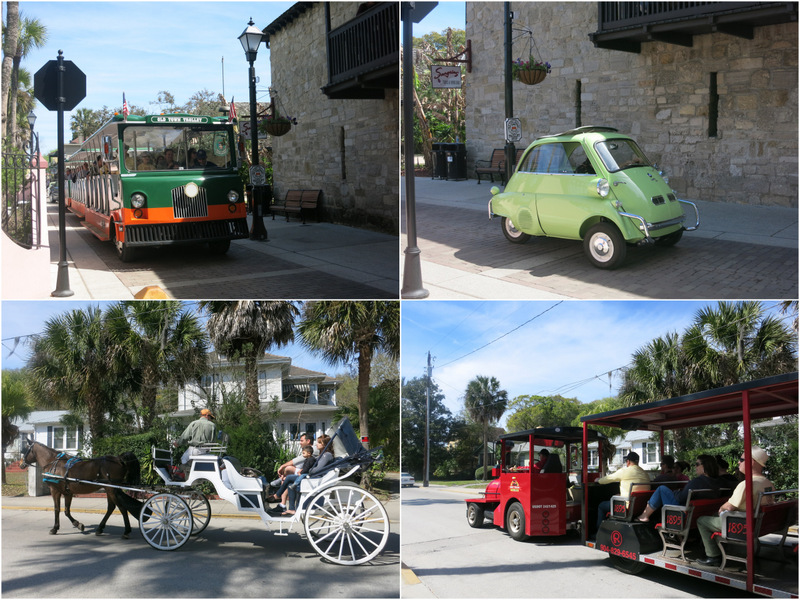 Here in St. Augustine you can choose between a trolly tour, a cute three wheeled rental car, a romantic horse and buggy ride, or a fake train tour. As usual, we bypassed all formal tours, trains, and equestrian modes of transportation in favor of a good old fashioned self-guided walking tour. 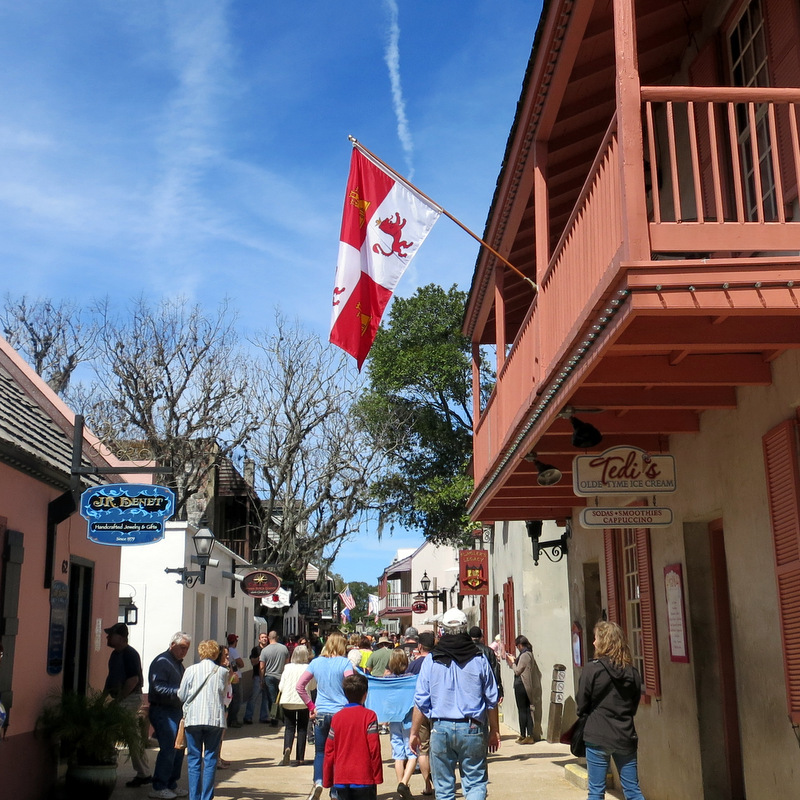 Starting with a stroll down St. George street. This is the main drag where all the tourists go. As expected, on this sunny Sunday afternoon the narrow street lined with historic buildings housing souvenir shops, ice cream parlors, and pubs was packed with people. We breezed through there pretty quickly in search of a less busy area. At the end of St. George we came upon the old city gates. Only a small section is left today, but these gates and walls once enclosed the entire city. 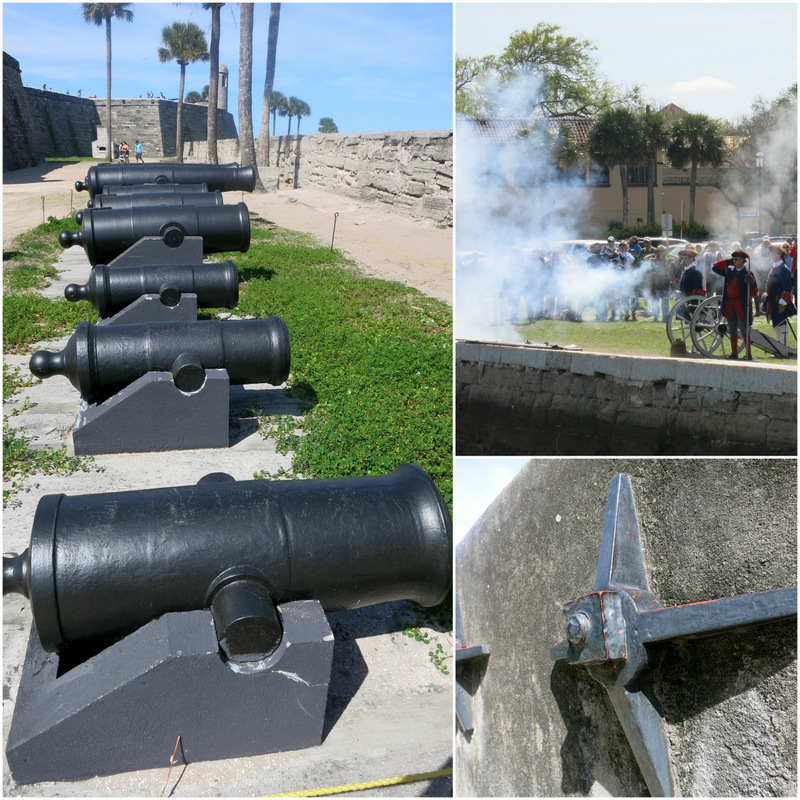 Next we meandered over to the Castillo De San Marcos. 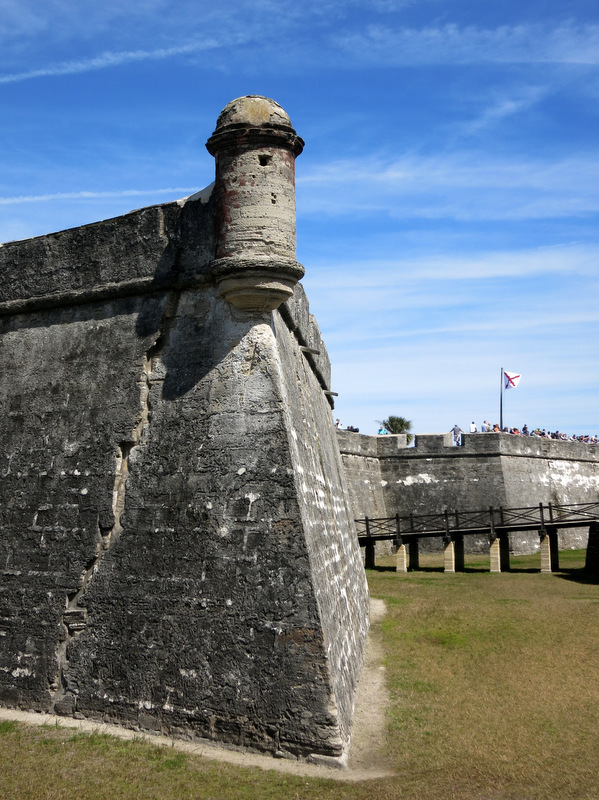 Sticking with the oldest theme, this structure is the oldest masonry fort in the United States. It was built way back in 1672 during the first period of Spanish rule. Over the years the fort was renamed Fort St. Mark by the British (1783), Fort Marion when it became a U.S. army base (1821), and then back to the original name in 1924. 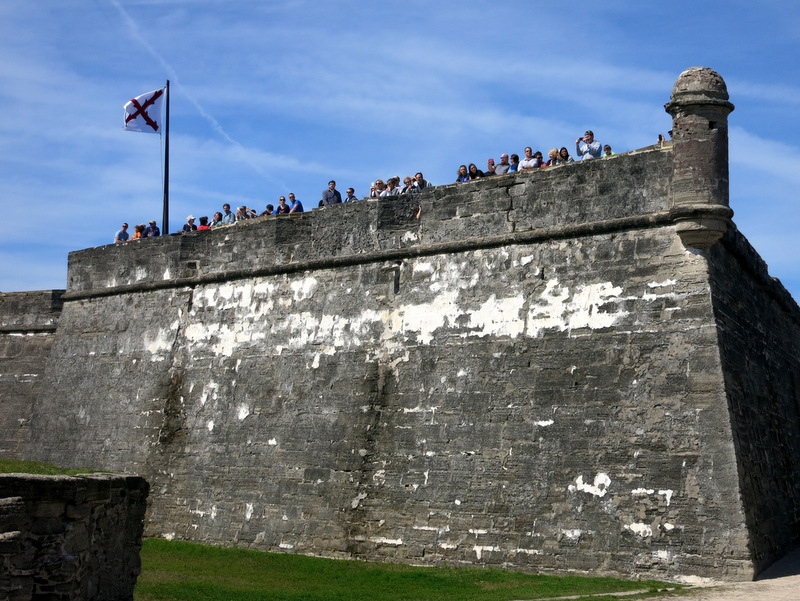 Today the fort is part of the national park service, and for a small $7 fee (free with your national parks pass) you can enter the fort and take a stroll through history. Or, you can follow our lead and explore the outside for free. It’s not that we didn’t want to go in, but the sheer number of people crowding in and around the fort made us decide to come back another day. Except that never happened because we spent so much time enjoying the campground and beach. Oh well, something to look forward to on our next visit. And stopped to admire the Lightner Museum. There was a brief discussion about going into the museum, but neither of us were feeling up for an extensive museum tour. Later we learned that the museum is basically just a collection of fancy stuff. Not our style. Glad we skipped it. Later in the week we took another walking tour. This time we joined these two on a more laid back tour of the south side of town. We first met Christen and Alayne back in December at Highlands Hammock State Park. 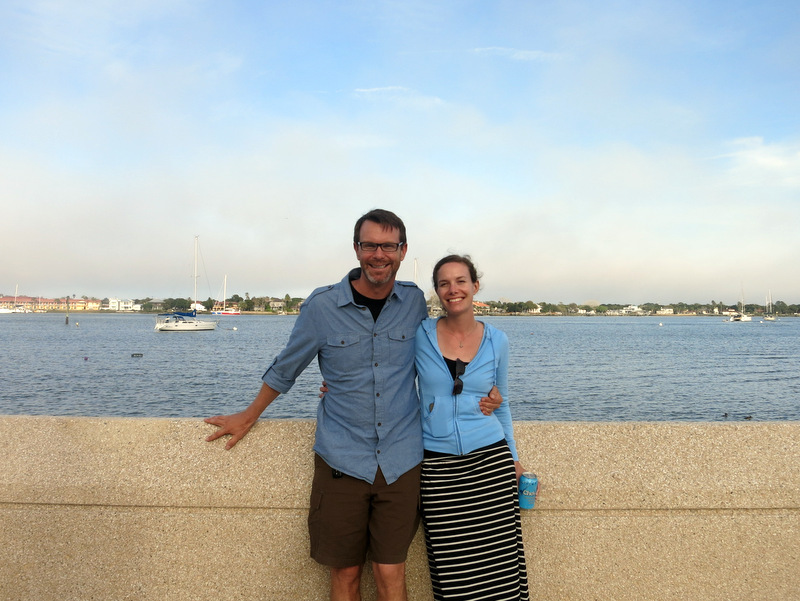 Since then they have sold their RV and settled in St. Augustine. It was so much fun to catch up again while soaking up some of the local knowledge they have acquired since becoming locals. Our tour took us through a variety of neighborhoods, along a small lake, up and down several narrow alley ways, and ended with a yummy dinner at Mojo BBQ where the food far out shines the service. As you can see St. Augustine and Anastasia Park warrant far more than a one week visit. We really only scratched the surface of what this area has to offer. I have a feeling this will be the norm for us over the next couple months as we move rather quickly up the coast with the goal of spending the second half of the summer and most of autumn in New England. I guess that means we’ll have to plan another southeast tour again someday. It’s the same feeling I always have at national parks. On one hand, I love seeing so many people enjoying our national treasures, but on the other hand, I wish they would all give me some space! 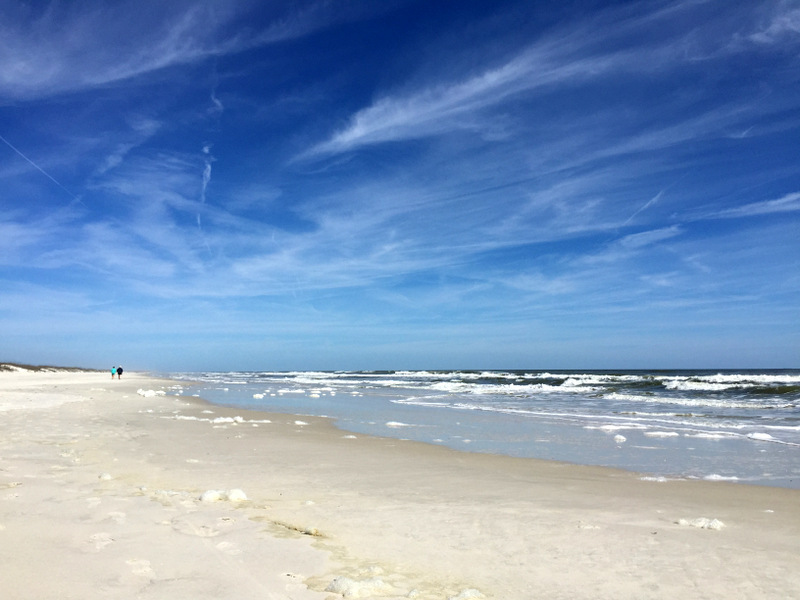 Luckily the beach at the state park was pretty quite and we enjoyed a few peaceful walks. We loved Anastasia as well and hope to come back for a couple of weeks IF we can get a reservation. It’s justifiably very very popular. 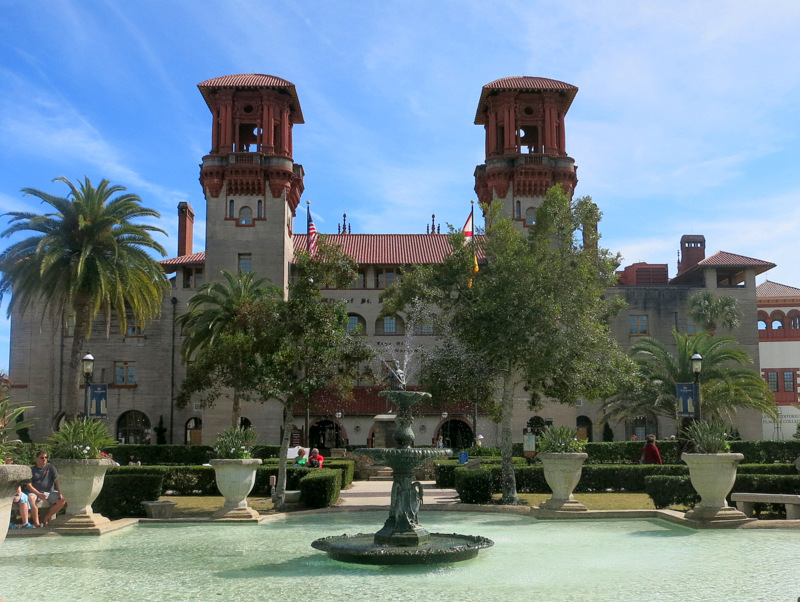 The inside of Flagler College is a knock out since it was one his flagship hotel. Your site looks fabulous and I love your pictures of the entrance drive and the beach. We feel very lucky that we got a site. As you said, it’s a very popular park. 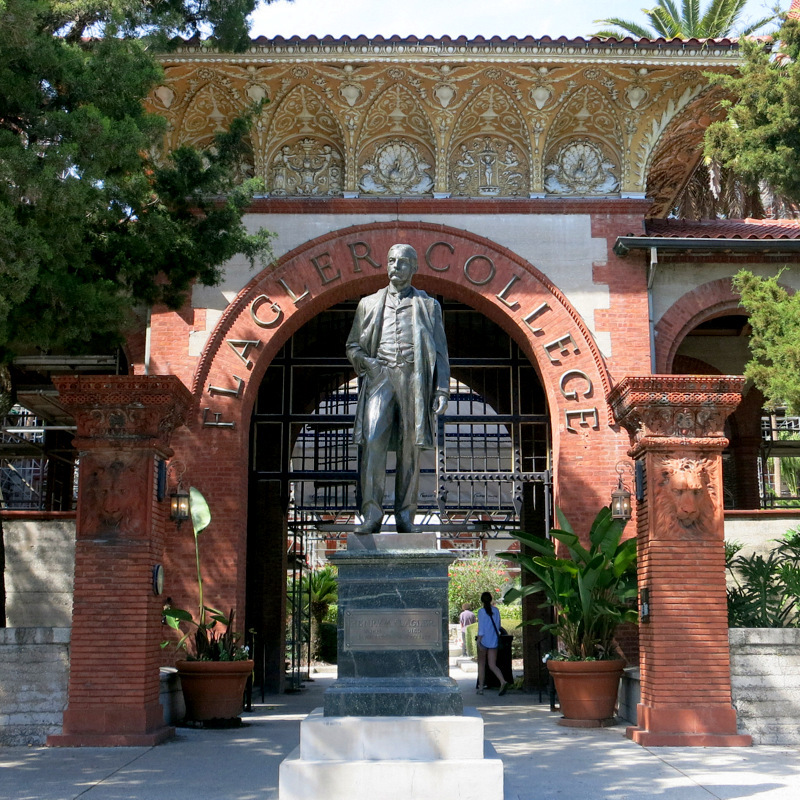 Someone else recommended the Flagler College tour, but we I guess we weren’t in the tour kind of mood that week. A history lesson, beautiful park and awesome trees. What more could a blog reader ask for? We will always call it home. Both Ilinke and I graduated from Flager, and we were married in Memorial Pres. Church. We just recently laid her mom to rest in the same church where we were married 13 years ago. It’s a beautiful and vibrant city. I too would be proud to call it home. Every time we’re in Florida we spend all of our time on the West coast. 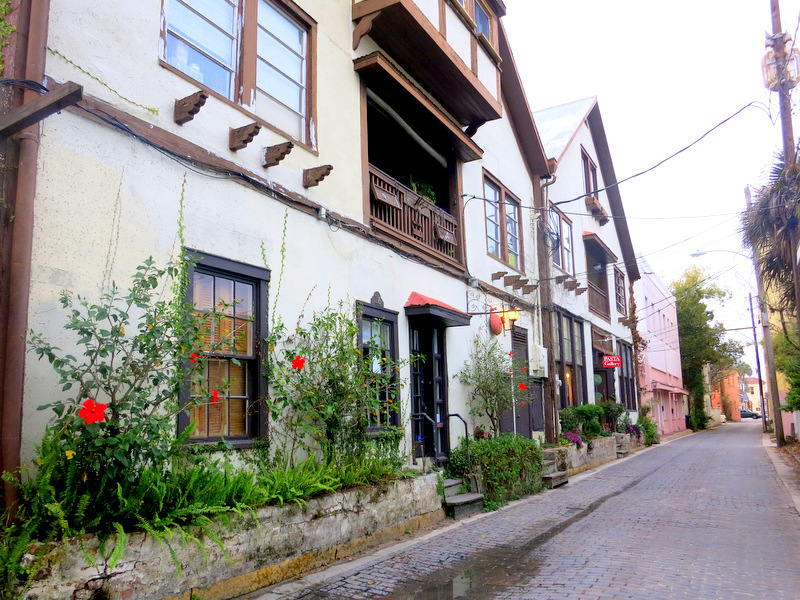 But seeing your enticing photos, we definitely need to plan to head to St. Augustine this year. Guess I’d better make reservations right now! Yup, make reservations early and expect lots of people on the streets. I have not had much interest in Florida except Harry Potter World. Now you have given me a few more reasons to visit. Florida has surprised us with all that it has to offer. What a lovely city and state park. Love your photos. May I ask, what kind of camera you are using? We leave in 13 days for a 4 month trek across the country and back to PA. You two are an inspiration. Thanks for sharing. We primarily use a Cannon Powershot camera, but I also take a lot of photos with my phone (iphone 6). The first, third, and last photo in this post are iphone pics. Have fun on your trip!